Whether you’re one of those brave souls who hits the great outdoors in the winter months, when the daylight hours are considerably shorter, or you just have a propensity for going walkabout in the evening, a camping torch is a good friend to have. Whether you’re keeping watch for potholes or puddles along the road, wildlife (or deceptively quiet streams) in the countryside, or, if you’re being honest, it’s just for getting you safely back from the pub after hours, it’s an essential ally. But which one is right for you? For such a little item, there are a surprising number of considerations when it comes to finding the best torch. First, is it small enough to fit in your pack, and light enough (with batteries, too) that you can carry it from A to B without cursing its heft? Secondly, is it durable enough to withstand everything you’re likely to throw at it? We know that no-one ever means to crush their torch with their walking boots or drop it in a puddle, all we’re saying is that it happens. Then, how bright do you need it to be? 150 lumens is a good benchmark for general use, such as bumbling around the house in power cuts, walking the dog, or even reading the meter. But for camping, and especially for middle-of-nowhere, middle-of-the-night hikes, we recommend going a bit brighter. Conversely, if you’re after a room light for your tent, to read or socialise after hours, you can go dimmer. Whatever your needs, our round-up is sure to feature a torch that’ll meet them. As a very small but very powerful flashlight, the Olight S1 Baton really does offer the best of both worlds. Its ultra-concentrated beam of light and maximum reach of 110 metres has led to it being likened by reviewers to a miniature sun, and it lasts a long time even while operating at its full 500 lumens. It also has a handy magnetic base, timed automatic shut-off, and a waterproof construction, and can be easily stashed in a pocket or clipped onto clothing. Wonderful stuff. After a long-reaching, long-lasting outdoor light? Your search ends here. With an astonishing maximum illumination of 8000 lumens, the Sidiou Group LED Searchlight is far and away the brightest on our list, making them perfect for covering lots of ground with scrutiny in low light. Despite its power, it’s still easily stashed in a small bag, while its solid-feeling aluminium construction makes it sturdy enough to withstand adverse weather and shocks. All that power, too, from one easily-sourced AA battery. 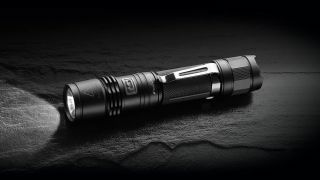 Another little torch that gives off a lot of light, the Fenix PD35 Tactical Edition offers you five brightness settings to choose from, up to a respectable 1000 lumens, the second-highest output on our list. Despite this, it doesn’t overheat even after hours of use, keeping it comfortable to hold over the course of a long walk. It also has an anti-roll, slip-resistant body design, so it’s simple to keep hold of even in wet conditions. Depending on what mode you use — LED for ultra-bright light, or the Directional Lighting function for softer ambient lighting — this Goalzero lantern can either give you 2.5 or an impressive 48 hours of continuous illumination. It’s not much bother if you do run out of juice though: this clever hand-held lantern is easily recharged over USB, with an external solar panel, or using the included hand crank. Oh, and it charges your phone, so you never have to be caught short in the wild again. Very smart. For under £10, this budget torch is nothing short of a marvel. With included zoom mode, something usually reserved for much pricier models, and five brightness modes, it doesn’t cut down on functionality even at a cut price. The anodised aluminium surface resists rust, and it’s somewhat waterproof (although don’t immerse it in water to test, you have been warned). It’s quite heavy for its size, though, so if you can splash the extra cash and need something more portable, you might want to consider the Olight. Not just for camping, the Petzl Reactick+ head lamp is a great problem-solver for all manner of activities, from night-time cycling or jogging to walking the dog. It’s also great for intrepid cavers or climbers who need all extremities free. The reactive light setting means it can respond to its surroundings for minimum fiddling, plus it has a great battery life, whichever type you choose, and can be recharged over USB. Most importantly, it’s light and comfortable to wear. Where does the Vango? It goes in your tent, of course, offering ambient illumination. Another cheap and cheerful lighting option for life on the road, the Vango disc light might not be a torch in the strictest sense, but it does make a great addition to your camping pack. Adept at illuminating even large tents (you can pop it on the floor or hang it from the ceiling by the included hook) or individual compartments so that others aren’t kept up, it’s great for late-night socialising or nodding off with a good book. For the price, it’s fair enough that it only performs one function, and does it well, but if you want a bit more functionality in your lantern, go for the GoalZero Lighthouse.